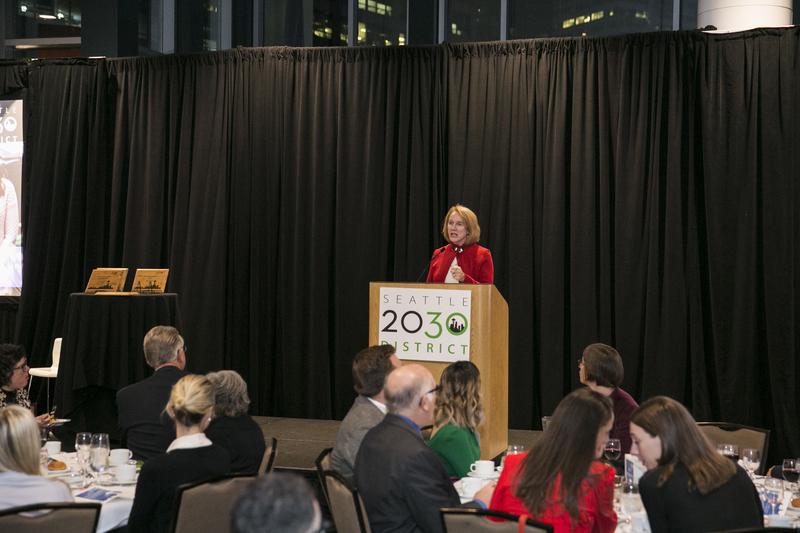 SEATTLE, WA – The Seattle 2030 District celebrated its 2018 Vision Awards on Thursday, October 4 at the Bell Harbor Conference Center with over 350 regional sustainability leaders working to improve the built environment. The Vision Awards honor those people and projects that are building for Seattle’s sustainable and vibrant future through design and construction. Awards are given in the following categories: Leadership, Energy, Water, and Transportation. “We can take pride in those accomplishments that make our city a leader on climate change and that enhance its resilience and livability. Our 2018 Vision Award winners have demonstrated how cities and businesses can step up to the challenges that we face with innovative, yet proven approaches. They also show that businesses don’t have to choose between profitability and sustainability,” said Susan Wickwire, Executive Director Seattle 2030 District. Over the last seven years, District members have been turning to Seattle 2030 for resources and advocacy to help them achieve the 2030 goals for energy, water and transportation. In order to better meet their needs, the District worked closely with the City over the last year to launch the 2030 Challenge Pilot and will be working on the final details over the coming months. Other priorities include building support for Seattle City Light’s new energy efficiency programs, getting to net zero carbon buildings, encouraging sustainable transit oriented development, organizing a green stormwater project competition, and promoting low-carbon commuting options in partnership with Commute Seattle that can also help with the anticipated increased downtown traffic congestion. The City of Seattle, led by Mayor Jenny A. Durkan, is demonstrating national leadership in climate sustainability at a critical time. In April, she announced new bold actions that affirmed Seattle's commitment to the goals established in the Paris Climate Agreement. In July, the City Council approved one of these actions - the 2030 Challenge Pilot Program, which creates incentives for sustainably retrofitting Seattle’s existing buildings. New Seattle City Light energy efficiency incentives will also make significant contributions. It has taken a team effort from the design and construction to the operations of Stone 34 to make it truly a model for sustainable buildings. The project participated in a variant of the City’s Living Building Pilot Program and incorporated a range of leading-edge features: hydronic chilled beams which provide more efficient heating and cooling; a phase change thermal energy storage tank; and rainwater capture for non-drinking purposes. After its first year of operation, a review performed by the International Living Future Institute confirmed that Stone34 surpassed its targets in energy by 15% and water by 27%. The building has an ENERGY STAR score of 100 and has two LEED Platinum certifications. In building Cyrene, a 169-unit apartment building on the Waterfront, Mack Real Estate Development reached out to its neighbor Enwave to meet its heating and cooling needs. Cyrene and Enwave are connected through an underground network of pipes that constantly exchange energy directly with the building’s systems, achieving energy efficiencies above 90 percent. The results are laudable - a 57% reduction in energy use that meets the 2030 goal, lower carbon emissions, and hundreds in savings per unit compared to gas. Without the typical cooling tower and HVAC equipment, Cyrene residents enjoy an expansive rooftop terrace, and more space is available to rent. Wright Runstad & Company has helped set the standard for water reuse in Seattle with their work at 1201 Third. The building utilizes groundwater that flows into the foundation and reuses it through irrigation, the fountain water feature, and most recently, the chillers and cooling towers. The success of this first stage prompted the building engineers to think bigger and harvest rainwater from the roof for the aux loop cooling towers at the top of the building. Between the two systems, the building saves an average of 864,000 gallons per year. Of the 1,100 employees in Expeditors’ downtown offices, only 11% commute by single occupancy vehicles and 79% commute via public transit, which is 34% higher than the downtown average. In order to achieve these amazing results, Expeditors has incentivized their employees to use transit, offered limited, non-subsidized onsite parking, and fully subsidized Orca passes which are distributed to employees on their first day of work. They also actively support biking through promoting citywide events, distributing information on how to bike, and providing showers and locker rooms. The Seattle 2030 District has over 140 members who have committed 51 million sq. ft. of Seattle’s downtown core to meet ambitious energy, water and transportation goals by the year 2030. The organization is a private-public collaborative working to create a groundbreaking high-performance building district in downtown Seattle and surrounding neighborhoods. The 2030 District harnesses realistic, measurable, and innovative strategies to assist property owners, managers, and tenants in reducing the environmental impacts of facility construction and operations. Visit the Seattle 2030 District’s About Us page to learn more.